These new products will be available in the store NOW!! There are three different bundles that you can purchase, the Smitten, Snowy Day or Cake & Confetti bundle. You can either purchase them in their bundles or as individual items. My first card is using items in the Snowy Day Bundle. 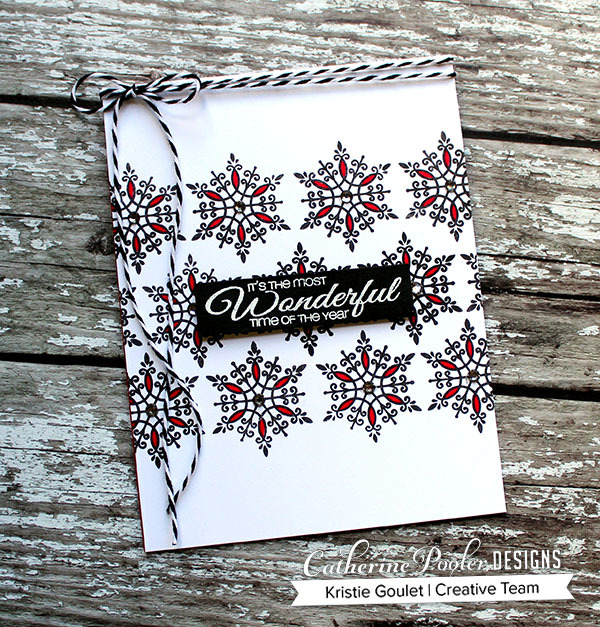 I stamped one of the gorgeous snowflakes from the Peaceful Flakes stamp set across my card front. I used my MISTI to get perfect placement. I then used my blender pen and Rockin' Red ink to color in parts of the snowflakes for a pop of color. The sentiment was white heat embossed onto black card stock and is from a previously released set called Snowy Sayings. I added some rhinestones to the center of each snowflake and some black and white twine to finish off my card. My next card is using items in the Cake & Confetti Bundle. I again stamped the candles across my card panel using Midnight ink. I then did some water coloring onto a circle die cut and stamped the sentiment using Midnight ink. 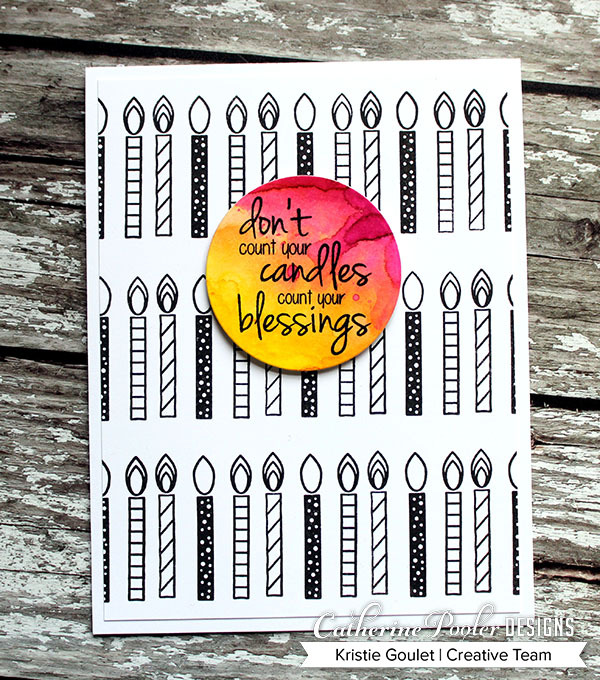 The sentiment is perfect to use with these candles and is from the stamp set Young at Heart. Make sure you leave comments on all the blogs in the hop today. Catherine is randomly choosing a winner from each blog hop days comments to win a $25 Gift Certificate to the store! Winners will be announced on December 17th on Catherine's blog. Time to hop along to the next stop on the hop which is the amazing Karen Baker! The complete blog hop list is below. Great cards! 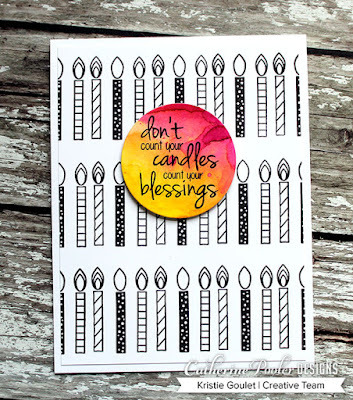 I never would have thought to stamp those candles in just black as a background. I think your ideas are wonderful --- great for some masculine cards! Awesome birthday card! I love the pop of color against the black and white background. Great ideas! Thanks for the inspiration. Love the designs of your fabulous cards. Fantastic designs, Kristie. Thank you for sharing your amazing ideas and being a part of this awesome blog hop collections. Merry Christmas. Awesome cards, Kristie. I love them both. Awesome cards. :) Love the birthday sentiment. I like the sentiment on the birthday card. Love how you did the snowflakes on the first card. The red really makes them pop! Thanks for sharing! I won't be hopping, but I will say I think your cards are wonderful Kristie, especially the candle one. Beautiful cards Kristie, love your candle background! Oh my, these are stunning. Love the crisp, clean look of these two designs. Thank you. Gorgeous cards! Love your designs with the pops of color - fabulous! Your first card is so elegant and striking! Love it! TFS! I love how the colors POP from the black and white! I love your cards. The candles look really cool black-and-white ,!! Amazing cards, Kristie; I especially like the black and red snowflakes with the most wonderful time of year sentiment; very striking!! Wonderful cards. Love the snowflakes. Such pretty cards. Your snowflakes just pop. Both cards are lovely but especially the snowflakes! Oh my your cards are perfect. I love your first card with the snowflakes and the red. What great inspiration -- to keep things in black and white with just a bit of color to bling it up. The snowflakes with a bit of red - so unique and lovely! Awesome cards! Love the repeated snowflakes and the repeated candles for your backgrounds! Two fun cards, and love the pops of color! That red on the snowflakes is so dramatic. HAPPY BIRTHDAY & EARN DOUBLE POINTS!!! !